Overall, voters showed broad support (79 percent) for banning bump stocks, which speed up the rate at which semi-automatic weapons can fire. That includes 75 percent of Republicans and 74 percent of respondents from gun-owning households. 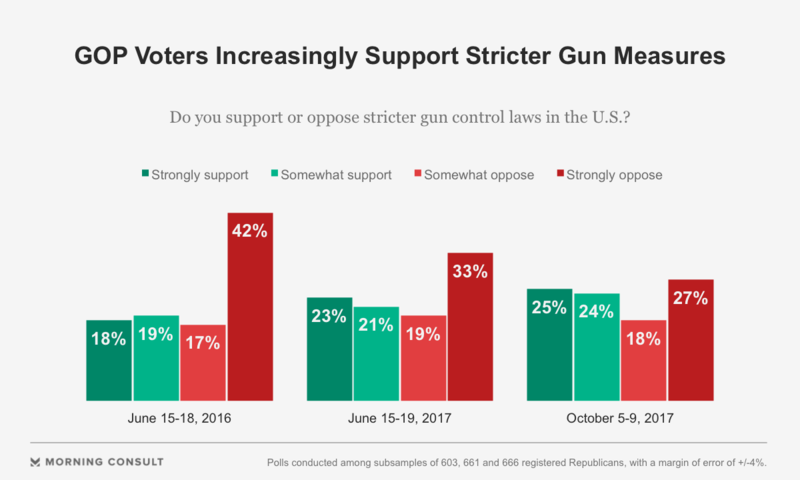 Republican voters continue to show a growing appetite for stricter gun control measures in the wake of the Oct. 1 attack on the Las Vegas Strip, the deadliest mass shooting in modern U.S. history, a new Morning Consult/Politico survey shows. In the national survey, conducted Oct. 5-9 among 1,996 registered voters, roughly half (49 percent) of Republicans said they support stricter gun control laws — up 5 points from a survey conducted shortly after a shooting attack on Republican members of Congress at baseball practice in Virginia on June 14, and up 12 points from a survey taken after the attack at the Pulse nightclub in Orlando, Fla., on June 12, 2016. Among all voters, 64 percent said they supported stricter gun control laws and 29 percent opposed them — a net increase of 7 points from June, when 61 percent backed such legislation and 33 percent opposed it. A majority of voters from gun-owning households (54 percent) also supported tightening regulations on guns. The debate over policy prescriptions to help prevent gun violence has been a recurring feature of the past several years as mass shootings continue to take lives at a growing rate. The 58-person death toll from Stephen Paddock’s assault on country music concertgoers in Las Vegas exceeded that of Omar Mateen’s 2016 assault in Orlando, which killed 49, and Adam Lanza’s 2012 rampage at Sandy Hook Elementary School, which claimed 26 lives. For the first time in decades, there is growing bipartisan consensus for sensible gun policy, a polarizing issue that has deeply divided Republicans and Democrats. In the past, consensus on gun control measures among most Democrats and Republicans has proven elusive, but the circumstances of Paddock’s attack may lead lawmakers to bipartisan ground. His use of bump stocks is coming under the microscope of leaders on both sides of the Capitol, including Republicans who are typically loath to wade into gun regulation. On Thursday, House Speaker Paul Ryan (R-Wis.), an avid hunter, said during an MSNBC interview that Congress should “look into” restricting purchases of bump stocks, which Paddock used to make his semi-automatic rifles fire nearly as fast as an automatic weapon, and Senate Majority Whip John Cornyn (R-Texas) told reporters that a bump stock ban was “worthy of serious consideration.” Some House conservatives, such as former Republican Study Committee Chairman Bill Flores (R-Texas), have also expressed concerns about bump stocks. White House Press Secretary Sarah Huckabee Sanders also said Thursday that the administration welcomes a discussion on regulating bump stocks. In the national survey, which was conducted online and has a 2-point margin of error, voters showed broad support (79 percent) for banning bump stocks, including 75 percent of Republicans and 74 percent of respondents from gun-owning households. In a joint statement Tuesday announcing they’d filed legislation banning the making and selling of bump stocks, Reps. Seth Moulton (D-Mass.) and Carlos Curbelo (R-Fla.) touted their “perfectly bipartisan” effort, which has 20 original co-sponsors evenly divided between Republicans and Democrats. “For the first time in decades, there is growing bipartisan consensus for sensible gun policy, a polarizing issue that has deeply divided Republicans and Democrats,” Curbelo said. Joining Curbelo from his side of the aisle were a number of top targets for Democrats in the 2018 midterm elections, including Reps. Leonard Lance of New Jersey, Ryan Costello of Pennsylvania and House Foreign Affairs Committee Chairman Ed Royce of California. Democrats who signed on to the legislation include two 2018 Senate hopefuls, Reps. Jacky Rosen of Nevada and Beto O’Rourke of Texas, and Rep. John Delaney of Maryland, the only Democratic candidate so far to announce a campaign for the 2020 presidential election. Sen. Dianne Feinstein (D-Calif.), a longtime advocate of more stringent gun regulation, has already introduced legislation in the Senate banning bump stocks. While there appears to be more fertile ground for a change to federal gun policy, voters surveyed remain bearish on its prospects: A plurality (38 percent) said the chances of stricter gun control laws passing Congress in the next year or so were poor, while 26 percent described them as excellent or good and 25 percent described them as fair. However, the share of voters who rated those chances as poor decreased by 7 points from the June survey.